Despite February coming to a close, summer is well and truly, still hanging around. Tanks are low, plants are thirsty and our air conditioners are due for a well-deserved break. There’s only one thing left to do – find the nearest body of water and dive in! Until the cooling winds of Autumn appear, we’ll be spending our weekends in one of Mother Nature’s greatest creations – the glorious swimming spot. If you’re visiting, new to the area, or are simply looking for somewhere to escape to this weekend, then this guide is perfect for you. There’s something for everyone, with some of the locations only 20 minutes out of the CBD, whilst others are around 1.5 hours’ drive away. We’d love to know what location is your fave, or if you have any insider tips for our readers. Until then – happy swimming! *Note: all travel times are based off driving from Cairns CBD. Most locations will require your own vehicle; however some may be accessed by public transport (Uber or local taxi service). What you’ll find: Cool, fresh water in various swimming holes and mini waterfalls along the mountainside. Hot tip: The bitumen pathway can get extremely toasty in summer, so don’t forget to wear shoes. What you’ll find: An outdoor, salt water swimming facility with varying depths and play areas for the kids. Toilets and showers are on site, with an array of food options right next door. 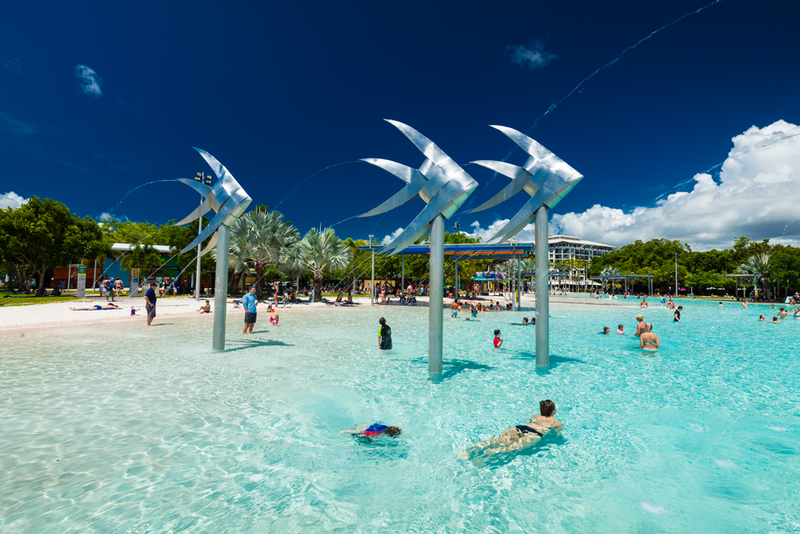 Hot tip: To have a stress-free swim, paid security lockers are available to hire out to store any personal items you bring to the Lagoon. What you’ll find: A large, fresh water swimming hole nestled among giant, granite boulders. Toilets and showers are on site, as well as gas BBQ’s and picnic tables for those looking to make an afternoon out of it. Hot tip: The water is a little chilling (or refreshing, as the locals would say), so it’s the ideal spot to wake you up or cool you down. What you’ll find: waterfalls, natural slip’n’slides and plenty of natural pools to take a dip in. There’s an abundance of wildlife to see, BBQ facilities for those feeling peckish. Hot tip: If you’re keen to dust off your hiking boots, there are a few trails in the area for newbie and experienced mountaineers alike. Find more information here. What you’ll find: A volcano formed lake filled with freshwater. BBQs, picnic tables and bathrooms are on site, as well as plenty of grass to throw your gear on. Hot tip: You can walk around the entirety of the lake, and keep an eye out for turtles as you do so! What you’ll find: Beautiful, clear fresh water with a picturesque rainforest backdrop. Dreamtime walk tours and self-guided walks are also available for those wishing to explore the rich history of the rainforest. Hot tip: There’s no pathway to access the gorge, so a regular shuttle bus service runs from the Mossman Gorge Centre to the centre of the Gorge. Please note there is a fee for the service. What are you waiting for? It’s time to throw on your togs, grab some snacks and slap on sunscreen. We’ll be sure to meet you there.